The most compact and affordable, the RX12U Robotic Lawnmower from Robomow is equipped with the latest features and specifically designed for smaller lawns up to 150 meter Sq with a maximum lawn size 250 meter Sq. Featuring a floating cutter deck, the solid 18cm stainless steel mulching blade on the RX12U perfectly follows the contours of any lawn giving an even finish across the whole lawn. Manoeuvring around the lawn, the twin wheel design ensures the blade can cut all the way to the edge of the lawn. Robomow effortlessly mulches grass cuttings into minuscule pieces; returning vital nutrients and water back into your lawn for a healthier, more beautiful lawn. Press go and leave it to mow; once installed, the one button press will set the mower off around your lawn. You can leave it to mow independently, with the ability to mow for up to an hour and a half. 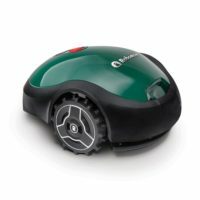 The Robomow will return to it’s charging dock automatically as the battery gets low to recharge automatically ready for the next time you send it to mow. A short one-time setup is all that is required, and with Robomow installation kits with the required pegs and perimeter wire are included as standard.